Byron Bay - a classic spot to spot a classic breach. The whale season is one of nature’s most spectacular sights and NSW coastal national parks are the ideal place to catch the action. Plan your next coastal adventure to Byron Bay to experience the whales enjoying their natural playground. Home to some of the most enviable whale watching in the country, NSW coastal national parks are the perfect location to see the annual migration. 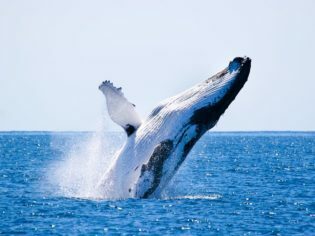 And one of the areas that you can make your whale watching experience extra special is in Byron Bay. During the whale season it is easy to spot whales from the beaches and headlands in the Cape Byron State Conservation Area. Stay a few days at one of the national parks accommodation options and be sure to head to the historic Cape Byron Lighthouse, where you can learn more about whales, grab a coffee and enjoy breathtaking views or wander along the Cape Byron walking track to see breaching humpbacks along the way. As well as being amazed by the whale migration, there are a vast array of activities in the area such as bushwalking, bird watching, photography and guided discovery activities. Mildenhall Cottage, close to one of Byron Bay’s best beaches. Lighthouse Keeper’s Cottages: These offer grand panoramic views taking in golden beaches, coastline and the iconic Cape Byron Lighthouse from the summit of Cape Byron State Conservation Area. The cottages have been lovingly restored to retain their heritage charm, with the addition of modern conveniences to ensure you holiday in style. There are two lighthouse cottages, each with three bedrooms, sleeping up to six. Mildenhall Cottage: With spectacular coastal vistas and direct access to one of Byron’s best beaches, award-winning Mildenhall Cottage is the ideal holiday accommodation for those who love nature and the beach. The cottage is one of four 1920s-1950s beach shacks that have been carefully restored to offer modern convenience with eco-tourism accreditation, while still retaining its original character, heritage and charm. Visitors can also log their whale sightings via the Wild about Whales smartphone app. It provides a map of the latest sightings and allows visitors to log their own sightings and contains information about different species, tips for spotting whales, and tours to help make the most of your coastal adventure in NSW’s national parks.